Jefferson County Library seeks to provide quality Library service to all users in a safe and pleasant environment. The Internet contains a wide variety of material and opinions from various points of view. Not all sources provide information that is accurate, complete or current, and some information may be considered offensive or inappropriate for certain groups. While Jefferson County Public Library is sensitive to the concerns of customers about Internet content, no one, including the Library, can control the information available on the Internet. Each individual is responsible for his or her own appropriate use of the Internet in a public place. Jefferson County Public Library complies with state and federal law guiding the use of filtering software in public libraries. Both Internet computers and wireless access are filtered to screen out obscene and sexually explicit websites in accordance with the Federal Children's Internet Protection Act (CIPA) and Colorado's Internet Protection Act. No filtering software is infallible. Filters may falsely block material that is appropriate in a public library setting or they may fail to block access to illegal or objectionable material. Customers may submit a Web Site Suggestion Form to block or unblock a specific site. Parents and designated caregivers are responsible for their minor children’s behavior while using computers at the Library. All computers are filtered. Filtering software is not perfect, and it may not block everything that might be considered objectionable. U.S. Copyright law (Title 17, U.S.C.) prohibits the unauthorized reproduction or distribution of copyrighted materials, except as permitted by principles of fair use. Users may not copy or distribute electronic materials (including music, electronic mail, text, images, programs, or data) without the explicit permission of the copyright holder. Any responsibility for any consequences of copyright infringement lies with the users; the Jefferson County Public Library expressly disclaims any liability or responsibility resulting from such use. All users of electronic information resources at the Jefferson County Public Library are expected to use these resources in a responsible and legal manner that is consistent with the Jefferson County Public Library Code of Conduct. All users are responsible for obeying state and federal laws. All users are responsible for abiding by copyright laws. Users may not attempt unauthorized access (including the disabling of filters or hacking) to any computer system. 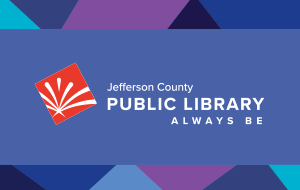 Jefferson County Public Library does not encrypt data sent or received through our Internet services so the connection should not be considered secure. Jefferson County Public Library has a zero-tolerance policy for anyone viewing sexually explicit images. Not complying is a violation of the disturbance policy and staff may end their computer session, ask the patron to leave for the day, and/or suspend his/her library privileges.